Excellent, you've decided to engage visitors using a custom tab design. Our design team has provide free pre-designed graphics available for download or have your own agency, designer, developer create a custom branded solution. File types: PNG, JPG, GIF or Animated Gif. File Size: We reccomend under 100k, but up to 150k is allowed. We like to recommended the file format of PNG which makes it so your image does not have a background. You knwo when you see an image and it's a perfect cut out with no white background, this what is called "transparent background". 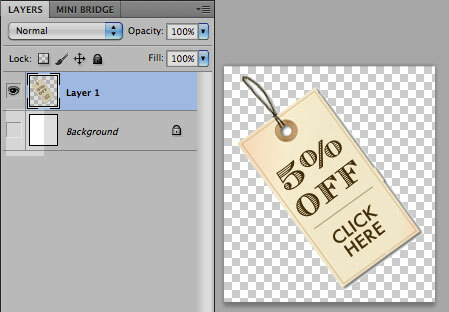 a. Toggle the eye icon on your background layer. This removes the background color. You can tell that there is no background as a gray and white checkered pattern appears. A. Select "File > Save for Web & Devices". B. 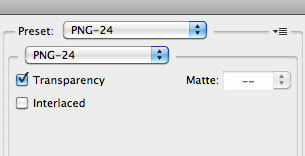 For file type choose "PNG - 24"
C. Important: Be sure to select the "Transparency" option. Ok, now that you have a cool custom tab to upload. Let's upload your design to your account. Step 2: In the left Navigation select "Design > Tab Editor > Custom Graphic> Upload. -Left or Right side positioning: There is a simple toggle on the "Widget & Tab" page. -Think outside the box here. There's no reason you can't create and present offers the same as you do with online advertisements. Create a full lenght skyscraper that takes up the entire right side of your site. -Match your offer to your current websites branding. Please share your own custom design by post links in the comment section!